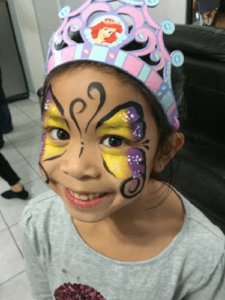 Welcome to Right Choice Children’s Entertainment Face Painting Toronto we offer a variety of talented artists with an educational background in Fine Arts. Our artists have tons of patience and talent along with many years of experience to back it up. 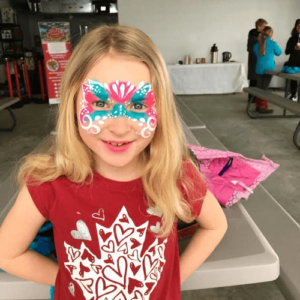 Face Painting is great for all events, graduation parties, grand openings, weddings, wedding proposals, baby showers, corporate events, picnics, fairs, birthday parties, or whatever the occasion might be! 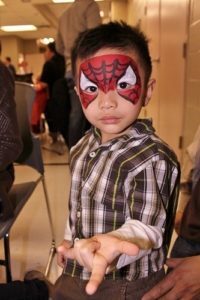 We have some of the best face painters available to hire in the Toronto area! Number of kids isn’t a problem our artist can do as many as 50 guests an hour. She does as many as 50-60 half faces or 25-30 full face designs in 1 hour. Our artist does over 50 different designs. To name a few of the themed designs we have princesses, butterflies, superheroes, ninja turtles, and much, much more. She has many designs to choose from while you’re waiting in line. Our Face Painters use top quality equipment with high quality FDA approved non-toxic materials. It simply washes away with warm water and a bit of soap. All of her paints and brushes are sanitarily treated with alcohol. And she brings special wipes to for use of guests if they’d like to change designs. She brings a mirror so that way they can look at their art the moment it’s finished that way they can enjoy the experience as much as the spectators. She uses many different colors, sparkles, and stick on jems to give your guests faces that unique touch. 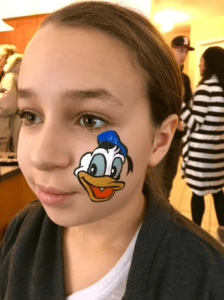 You will be laughing at how many adults will even get inspired from their child’s face painting designs that they themselves will want their face painted as well. Face paints are terrific for group photos, and the best thing is they simply wash away easily with warm water and a bit of soap. Face painting has always been a fun activity for kids. Kids love to dress up in different characters whether it’s Christmas, someone’s birthday or any other occasion. The face paint can really take a child’s imagination to a whole new level. 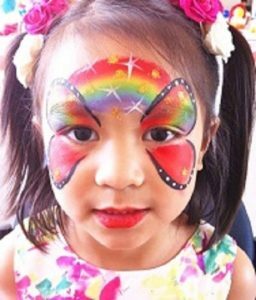 At Right Choice Children’s Entertainment, we make sure face painting Toronto is done by talented artists who are really good at handling clients of all ages. Whether you need a face painter for a baby shower, birthday, wedding or even corporate event, we’ll help you find an artist that’s perfect for the occasion. How many face painters do you need for your event? One of the questions we get asked most is whether our artists will be able to cater to a large event. The number of people you have in your event is never an issue with us. One artist can handle as many as 50 people every hour leaving each one happy and satisfied with the result. The time it takes to complete the face painting for each guest will depend on whether someone wants a half-face or full-face design. We can even do up to 50 different designs at a single occasion. 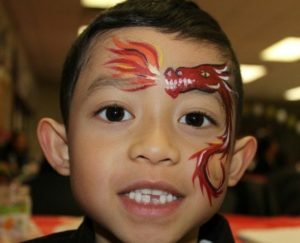 If you have a small function like a private birthday party or a community event, our face painting artists can come to you dressed up colorfully. Whether you want our artist to dress up as a clown or a princess, we’re here to fulfill your request. We don’t just face paint in birthdays, we also offer the service in other events like fundraisers, church functions, and family gatherings. All you have to do is give us your unique requirements and we’ll customize a face painting service that works best for your event. Is face painting safe for your kids? The next time you’re taking your child for face painting Toronto, make sure you ask what products are being used. Not all acrylic craft paints are designed to be used on the skin. In fact, some are completely unacceptable. Some watercolor pencils and markers are also very harsh on the skin. We use FDA-approved face paints which are non-toxic and do not contain any harmful metals like lead. We source our face paints from trusted manufacturers who use high-quality ingredients that are completely safe on the skin. You can simply wash away the paint from your skin with some warm water and a bit of soap. As for the paint brushes, we take the necessary measures to enhance hygiene. All the paint brushes are treated with alcohol and properly sanitized before being used on a client. It is not uncommon for the paint to stain slightly but for a very short period of time. This will also depend on the skin type and how long you’ve worn the design. Our face paints only contain approved cosmetic ingredients that can be removed using baby wipes or a mild soap/shampoo. Many may assume that face painting is just for kids. 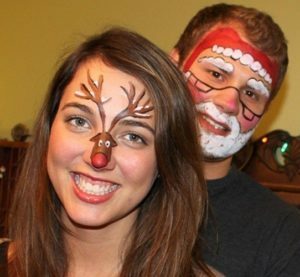 Adults also get fascinated by face paints, especially during dress-up holidays. First of all, the face paint can take your costume to another level. While face painting in adults requires extensive know-how and quite some time, it’s always worth it in such events. Imagine looking in the mirror and seeing a gorgeous paint of Wonder Woman staring back at you? You can dress up like an iconic woman and have your face painted to create the complete look. Adults can also enjoy face painting on occasions such as baby showers, bridal parties, and graduation parties. You can have a face painter at your function to help you bring the theme of your party to life. In such cases, the artist will be given or can come up with, themed designs which guests can choose from while they wait in line. Guests can feel free to choose different colors and gems to give their faces a unique touch. The designs can range from funny to interesting or anything in between. The face paints can be amazing if you have a photobooth where people can take pictures for keepsakes. Whether you want to look like a superhero, a movie character or to unleash your wild side, face paints can give you unlimited possibilities. Are you hosting a party or any other event and need to book a face painter to entertain your guests? There are certain essential things you need to look for when hiring entertainers. Take your time to find a suitable entertainer who will fulfill your expectations. First, you need to understand what you need and expect the face painter to do during the event then begin your search. At Right Choice Entertainment, we always offer our clients value for money. Below are a few reasons why our entertainers are a great choice to keep your guests occupied during your next event. 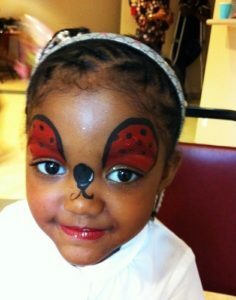 At Right Choice, we don’t just offer face painting services. Quite often, our clients will want other complementary services such as caricature artists, balloon twisters and live DJs at the party. They never have to work with a different company to fulfill such diverse needs because we can do it all. We know that friends and family may offer to help you at the event claiming that they can do face painting for free. But before you take the offer, think of the level of competency they have in face painting. We offer experienced and skilled artists who not only love what they do but are also really good at it. Face painting may appear to be a simple activity but there’s a lot that goes into making it a success. First, the face painter has to arrive on time and come fully equipped with all that’s needed to complete the service. Our artists have been hired in numerous events and they come with the makeup, sponges, brushes, glitters, water pots and wipes among other items needed to get the job done effectively. We don’t compromise when it comes to face painting our clients. Time and time again people hire entertainers for their events and they let them down last minute or never show up on the agreed date. This often happens when you take an offer from a friend or relative who will give you an excuse last minute for not showing up. Panic ensues and you need to find companies that offer face painting fast. The best move is to call us as soon as you start planning the party so that we can organize for a face painter to come and keep the little ones amused. The best part is, we never cancel on our clients. Some parties, especially company events and bridal showers, are usually run on tight schedules. You need reliable entertainers who will show up on time. At Right Choice Entertainment, we always respect our client’s time. If you want all the children at the event to have their face painted, we will recommend the number of artists you’ll need to hire to make it possible. We want to avoid situations where children cry and throw tantrums because they’re tired of waiting too long to have their faces painted. Our artists have the speed and commitment to work on as many children as promised. Our artists are smart and presentable and this speaks a lot about the kind of work they do. We take our job very seriously which is why the face painter has to arrive dressed accordingly to the party. If you want the artist to come dressed in a specific costume, we can honor this request provided you share the information in good time. We know kids love the goofy faces and funny costumes that most entertainers wear at parties so we’ll do all it takes to keep the little ones happy. Don’t think of face painting for birthdays and BBQs only. 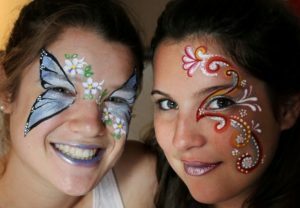 You can incorporate this activity into other events such as weddings parties; face painting will always make it more fun. 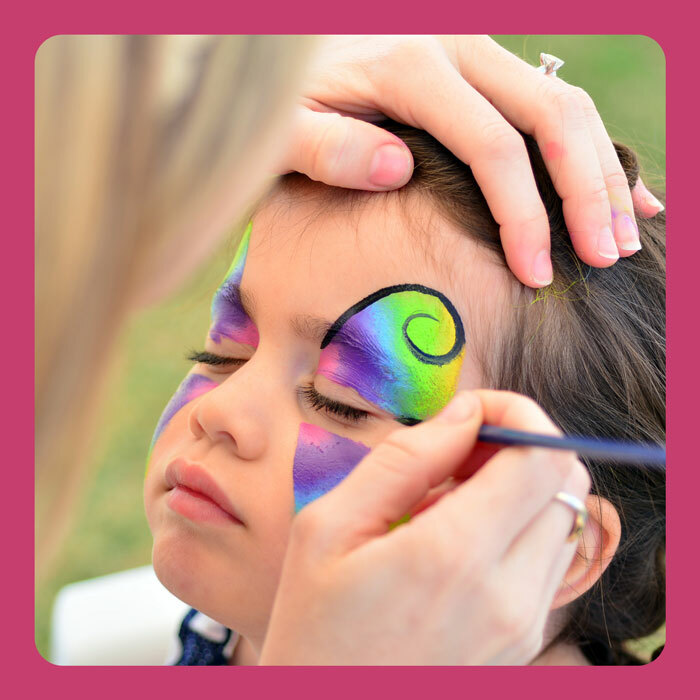 We’ll share some tips to make face painting work for other events. In weddings, face painting can be very ideal especially if you want to keep the children entertained during the reception. At Right Choice Entertainment, we have professional face paint artists who come with the equipment needed to get the job done in weddings. We know that many of our clients are looking for a glamorous and magic addition to their special day. Our artists know just the kind of creative face paint and glitter that will wow your guests. For bridal parties, face painting would be a great compliment especially if you have a specific theme or custom design that you need to pull off. It will certainly help you to get better photos and keep guests entertained. If the guests will be wearing specific costumes, the face painting can bring the characters to life. Need a pregnant belly painting for your shower? Face painting Toronto can make your baby shower an event to remember. You can even use the skills of a face painting artist to announce the gender of your baby to friends and family during the party. Face painting can make stunning baby shower photos. Whether you need someone to paint your pregnant belly or keep guests entertained, we’ve got just the perfect match for you at Right Choice Entertainment. Face painting can be very ideal in corporate parties too. It’s a nice way to create excitement and bring attention to your event. When you work with Right Choice Entertainment, you are guaranteed professionalism and talent which is a perfect match for companies that are looking for artists to entertain their guests. We can create a custom service that best suits your company’s event. 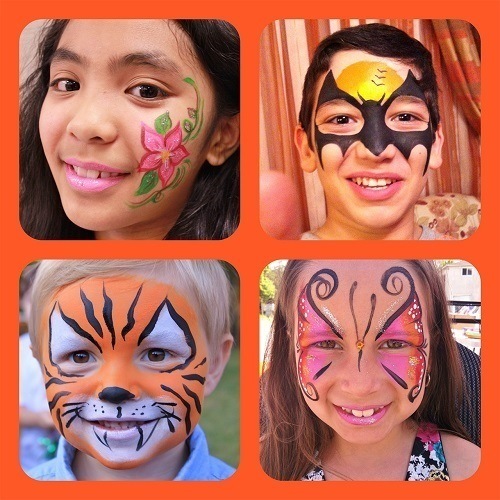 Face painting can bring color and life to graduation parties especially those that are filled with kids of all ages. In fact, if you’re planning a sweet 16 party for your teen, an entertainer will be a great compliment. Just make sure the kids are allowed to choose the designs which they will have on depending on the theme of the party. Grand opening parties are usually the biggest marketing push when a product/service is still new. The event needs to be super fun in order for you to win over the skeptics especially potential customers. You can attract people by having a face painter to entertain the guests. The artist can have a theme with different designs which feature the product or service you’re launching. Need help entertaining your guests? There’s so much that you can do at a party to entertain your guests but most of it would end up costing a fortune. Face painting is an affordable and fun way to keep guests of all ages entertained. We can help you create that special moment for your kids, their friends and other guests at a party you’re planning to host. 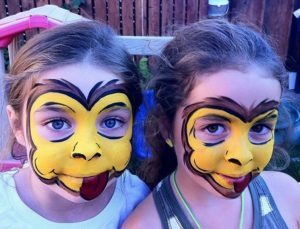 Our face painters are experienced artists who love working with children of all ages. Therefore, if you have a special occasion coming up, we can offer the best face painting in Toronto. As one of the leading face painters in Toronto, our artists offer a wide range of designs. From monsters to princesses, animals and cartoon characters, we’ve handled numerous fun projects over the years. We can help you to come up with themed designs for your party so that the kids can simply choose something that they love and would complement the occasion. Our goal is always to create happy faces and entertain crowds. From face painters who don’t show up until last minute to those who use the wrong products resulting in serious skin reactions, we’ve heard all kinds of horror stories from party hosts. Some of our clients are skeptical when they come to us for face painting services because they’ve been ripped off by entertainers before. That’s why we decided to help you out the next time you need to hire a face painter in Toronto. There are lots of professional face painting artists out there and you need to do enough due diligence to find one. Face painting doesn’t have to be a bad experience for your guests. In fact, a professional with skill and experience working with different audiences can make your party extra special. It’s hard to find the right entertainer if you don’t know what you’re looking for. With that said, let’s go over a few factors to consider when hiring a face painter for your next party. This would probably be the last question in your mind when hiring any party entertainer but it’s very critical. You don’t want to find yourself in a situation where you’re getting sued if the professional or their stuff is damaged at your party. In fact, if the entertainer isn’t insured, consider this as a major red flag and look the other way. Does the entertainer use quality, FDA approved products? Make sure you ask about all the products that will be used by the face painter. 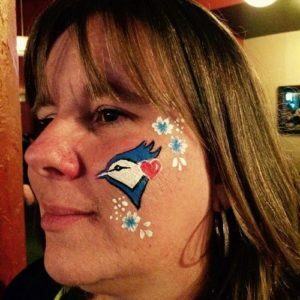 There are unique FDA approved face paints that the professional must use. This is to ensure the products don’t react with the skin causing burning, itching, and irritation. Some face painters go for cheap acrylic paints which may contain harmful chemicals that can even lead to burns. It’s important to ensure the safety of your kids and other guests is guaranteed by hiring a face painter who uses the right products. Can he/she handle your guest list alone? The face painter should give you a reasonable estimate of the number of kids he/she can handle in an hour. Most face painters in Toronto can comfortably handle 10 to 15 children in an hour. This will depend on the designs being done and the age of the children. Toddlers may take longer to paint than older kids. If the kids are going to be choosing their own designs, it can take a longer time to paint each one of them. Keep in mind that the painter may need to do other stuff like cleaning the brushes while painting. Will everyone be painted? Do they have restrictions as to who can be painted? Face painting is not for everyone. If you have guests with serious skin conditions, there’s a high chance that the face painter will refuse to work on them. Kids below the age of 3 usually have sensitive skin so it’s important for the parents to be notified and forewarned. Furthermore, a friendly face painter wouldn’t paint a child who doesn’t want it. It’s not worth it painting a child who’s being dragged by their parent or is asleep and wakes up to a strange looking face. What does the face painter use to maintain hygiene? Hygiene is key when offering face painting services. The best face painters will wash their brushes regularly and ensure they change the water often. Some things such as the sponge shouldn’t be shared among kids. Products like glue should be skin safe. Ask about how often their equipment is cleaned. A professional face painter should clean their equipment thoroughly after every event. Watch out for face painters who use dirty water to activate paint. Can you see pictures of previous setups? It’s good to have a clear idea of the kind of set up the face painter has. Professional face painters are very clean and tidy. 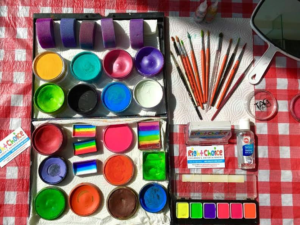 The set up can be as simple as a table with a chair with the different paint colours and a few designs beautifully laid for the kids to choose. The professional should have a bin to keep off all the dirty sponges and leave the space looking neat and clean for the next client. If you find the right professional, you’ll notice how well they’ve organized their kit, paint brushes and colours. This kind of organization really helps the face painter to be clean, efficient and impress your guests. Can the face painter show you examples of work done? Ask for examples of previous work done. A reliable face painter won’t be afraid to showcase their work if it’s good. Make sure you look closely enough because it’s easy to tell when someone copies content from the web and presents it as their own. Be cautious if the face painter in Toronto doesn’t have a business email or website. How do you book their services? The face painter needs to offer a professional and straightforward way to book their service. It can be as easy as filling an online form with your details then paying a small deposit online to secure the booking. Make sure you are given a contract which you should go through and ask if something is unclear. Read the contract as it may protect you especially in instances where the face painter cancels or just doesn’t show up even after you’ve made part of the payment. Finding a professional and friendly face painting artist doesn’t have to be expensive. You can find someone, who is not only creative but also skilled and passionate about their job, at a price you can afford. The trick is to go over their work and ask as many questions as you can to find out if they are the right fit. The best option for your event is certainly someone who will make your guests feel comfortable and special. 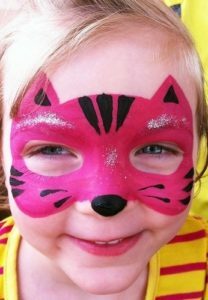 If you need help finding a face painter you can trust, get in touch with us today. Invest in proper entertainment by choosing a professional face painter Toronto with the above tips in mind.